Analysis: The Huskies came closest to upsetting reigning champs Fayetteville-Manlius a year ago at NXN, finishing second to the national champs by just five points. And while the team graduated two, including its No. 1 runner, Sarah Schmitt, the program returns five of seven. The team also will welcome in a transfer who placed second at Illinois' state championships last year and a competitive freshman who will fit into the team's top five. Don't expect Naperville North to drop anytime soon. How long have you coached at your school (and who are your assistants)? This will be my 25th year at NN, 23 as head coach. Our coaching staff includes me, Anna Kraftson, Deanna Nesci and Jen Weigand. What is your meet schedule this fall? 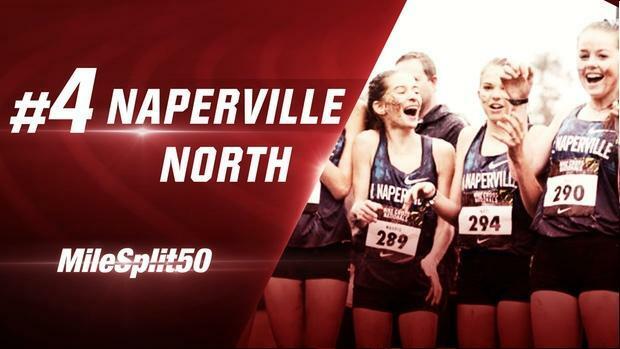 We run at Pleasant Valley (IA) on September 1st, First to the Finish Invite at Peoria on September 8th, Griak on September 29th and Naperville Twilight on October 3rd prior to our Conference and State Series. How has summer training gone for your team? What have you focused on during the summer months to better prepare for the season? Summer has gone very well. We are, to a person, in very good shape. We have focused on continuing to grow and develop our depth through our normal routine of building mileage and creating challenges for each runner. Overall, our summer has been excellent. Which athletes do you see as the probable top five (and six and seven) this season? Or you can just name as many athletes as you prefer. We have a lot of potential members of the top seven, for sure. But I'd say that Alex Morris (sr), Campbell Petersen (so), Claire Hill (sr) and Lucy Westlake (fr) are likely to be members. I'd also say that Megan Driscoll (sr), Audrey Mendrys (so) and Maggie Gamboa (so) all have good shots, as they are returners from last year at NXN. However, we also have lots of other runners who have very legitimate aspirations to make the line-up. They would be Madeline Cody (so), Jana Dawson (jr), Molly Morton (so), Kate Donaldson (so), Claire Bruce (jr), Sophie Bruce (sr), Natalie Walsh (sr) and even a few others who have legitimately high hopes. So our hope is that the depth we have would lead to the development of a really good team as the season progresses. Who are your team captains or leaders and what stands out about them as examples for the rest of their teammates? Our team captains are Alex Morris, Claire Hill, Megan Driscoll, Sophie Bruce, Natalie Walsh and Shirley Sallas. They were selected by their teammates, and they all stand out as responsible, dedicated, outgoing leaders who set our direction each day by what they say and, more importantly, what they do. We expect our runners to be students of the sport, and our team leaders certainly are expected to be leaders in that regard. Who are some new faces who will make an impact on your team this year (i.e. freshmen, transfers, runners who have improved a lot)? I've already listed a lot of kids who could really make a difference in our top seven, but Lucy Westlake (fr) and Campbell Petersen (so - transfer) should be newcomers and difference makers for us in the top seven. What foundational workouts have you focused on building your team around this preseason? Our summer features a 10-mile run weekly over the last four weeks, and it is a chance to gain aerobic power and efficiency for our strongest athletes. What will be the biggest reason why your team is successful this season? Our team will be successful as we gain maximum benefit from our depth. We cannot survive well unless we selflessly embrace both our individual improvement, but also the role each athlete can play in the development of her teammates. We have a lot of growth and development to undergo this year if we are to reach our potential, but the presence of our depth makes me optimistic. What will be the biggest obstacle or challenge facing your team this season? Complacency is always the greatest challenge. We have a tremendous history, but we must write a new chapter each year, and the girls have to appreciate that no one will give us anything. We must show up each day at practice with purpose, presence and focus in order to create something really special this year. Our culture is vital to our survival from year-to-year. We constantly create an environment where each girl is well-supported in her efforts to maximize her potential. We have to both foster competition among the team, but also to control it in a way where the team members are running hard as much to make themselves better as to make the team better. It is a tough line to hold, but our culture is built on that principle. When we build it that way, every athlete on the team - simply by her effort towards daily improvement, can have a great effect on everyone else. What are your top three goals for the team this fall? I try not to have targets for the girls, as I want those to come from them. However, I'll only say that I want to be able to say that the 2018 season, at its conclusion, was a reflection of the fullest possible collective potential of these athletes. To do that, our sights will certainly be very high all season long.